The conference began on October 11 at 9am, with breakfast and registration starting at 8am. The conference ended at 3pm on October 13. Wireless: information is on the back of your nametag, you can get directly to login page here. A complete campus map can be found here. Important locations for ETAP4 are shown in the annotated campus map inset to the right. An interactive Google map with important locations/directions for ETAP4 is given below. Uber and Lyft are available in the area, too. Information on parking is here, including an interactive map. You can park in any outside lot for free on Saturday; try Lot 25 or Lot 71. On weekdays, you could park in the Parking Garage ($1.75/hr) or at the Visitor's Center ($1.50/hr, you can pay using Parkmobile or at the machine). You can also get a $8/day temporary one-day parking pass from Parking Services, which is next to Lot 25. 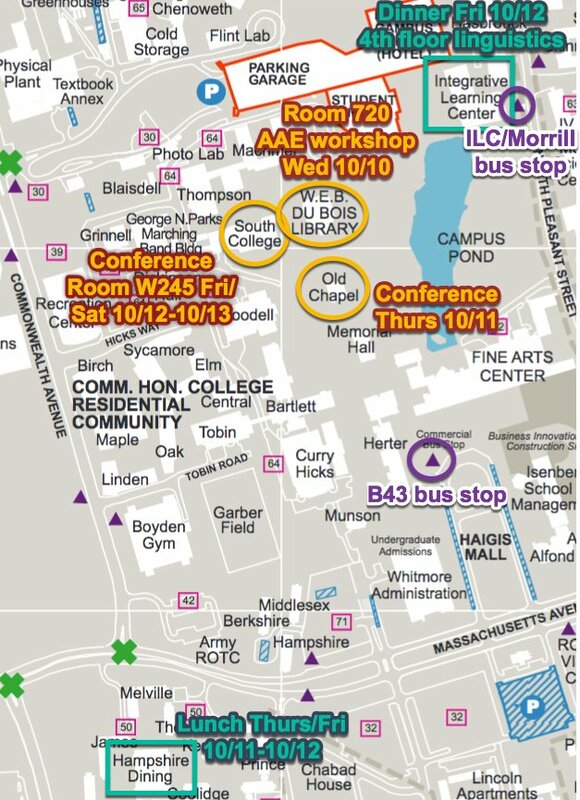 Warning: there's another big conference at UMass Wed-Fri, so the campus garage may be quite full, and overflow parking for that conference is in Lots 25, 12, and 45.